Kathleen Anne Epperson’ 17 MS left the classroom to pursue a master’s at the College of Education. After being reminded of the rewards of teaching, she’s now headed back to the classroom. Why I Chose the College of Education: I was raised by two Wolfpack alumni, so it was only a matter of time before I ended up at NC State. I ultimately chose the College of Education because of it’s reputable strength in science, technology, engineering and mathematics education research and teacher preparation. Why Education is Important: The ultimate goals of education are to foster critical thinking and empathy. I don’t want my students just copying a math procedure; I want them thinking about the concepts, developing arguments and justifying mathematical rules with their own findings. Supporting students to develop their own critical thinking skills is the best way to encourage lifelong learning. It is important to encourage students to consider the views and experiences of others. Encouraging empathy allows students to connect with others and recognize that there is more than one way to do or experience something! There are many different platforms where students can develop their critical thinking and empathy skills, but I see the classroom as one of the most important. That is what I strive for in my own classroom and it is why education is not only important, but crucial. 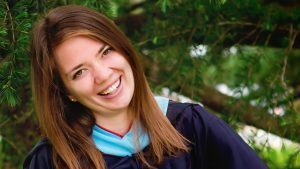 Why I Chose to Pursue a Master’s: After four years in the classroom I found myself wanting to pursue higher education. I was particularly interested in mathematics, because it was a subject I always enjoyed, but I watched many of my students and fellow teachers struggle with it. It was nice to spend these past two years reflecting on my classroom experience, while learning how to teach more effectively. Why I am Returning to Education: I recently went back to visit the middle school where I used to teach. As much as I enjoyed teaching, I was worn out by all the frustrating parts of my job and I felt my career needed to move in a different direction. When I went back, the sixth grade students I taught were now eighth graders. As I turned the corner of the eighth grade hall, I heard loud shrills and two of my former students ran up to me. Before I realized it we were all hugging and crying. In that moment I realized nothing else mattered to me but meaningful relationships I had built with my students. They were the reason I went into to teaching, and they are the reason I am going back. My best advice gleaned from these experiences is this: At the end of the day, there will always be things that frustrate you, and the first years will be harder than you think; but if you can remember why you decided to teach and find a way to accept (or change!) the things that wear you down, it will be worth every struggle.